growing twins X 2: toy guns? we decided a long time ago, well at least four years ago, that we would not allow our boys to play with guns. it seemed like an easy decision at the time, but it has proven to be very difficult to stick with. every time we go to someone’s house they all seem to have toy guns, and we are constantly explaining to the boys that we don’t play with guns…it’s more like mommy and daddy don’t play with guns. the boys have managed to turn almost any toy, straw, stick, and their hand into a gun…bam, bam! today we went to a birthday party, and guess what was in the piñata? 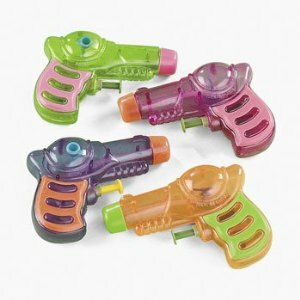 squirt guns! every single child at that party, and some parents were squirting each other except my boys..i felt terribly bad for them, but since i know how their dad feels about it, i stood my ground.. well kind of, i told them to put them in the bag and ask daddy when they got home. let him be the bad guy. since the three year olds were not there, colton managed to grab two extra for his brothers…how sweet, right….well this made me feel even more guilty of course. landon even told me that it is not dangerous and it only squirts water, and colton of course agreed with his brother’s logic. really though, i highly doubt that there is any evidence that boys who play with squirt guns are more aggressive than boys that don’t. i also struggle with suddenly allowing them to play with them since we already told them no…i don’t want to raise them to believe that something is ok just because everyone else is doing it. but, drew and i did decide that they are just “squirt guns” and eventually they will be allowed to play with them.